Welcome to Abraham Maslow’s Hierarchy Of Needs Pyramid. Maslow was a psychology professor and researcher who created this powerful pyramid detailing the stages that one must move through to actualize their full potential in life as a fundamental part of his research. I wanted to take a moment today to show you this pyramid and explain why you might be focused on the wrong end too heavily! We all shoot for transcendence and the full moon and stars, but we need to really nail the basics before jumping ahead of ourselves if we’d like to create a life that works! 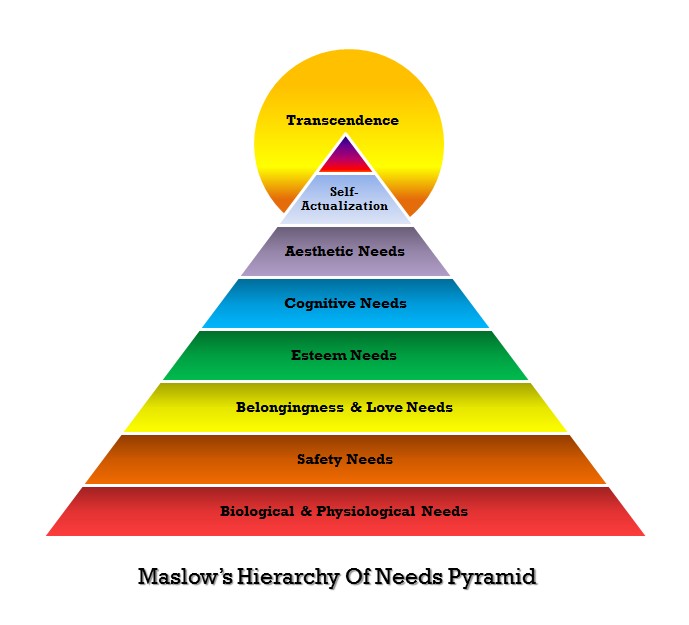 What makes this pyramid- and all of Maslow’s research- so compelling to me is that he studied happy and successful people, which was particularly uncommon in psychology. He studied thousands of “peak performance” individuals who seems to impossibly live up to so much of their potential as beings. His findings may help you to understand a bit better how to make shifts in your life to create real, stable gains and build a solidly successful life. We can start from the bottom of the pyramid. Always from the foundation we work our way up. Let’s look a bit at what each section involves and how “solid” you feel at each level. As we move up the pyramid, when you find the spot where you say “uh oh, not really doing too well on this level..” that’s where you can concentrate before shooting up the ladder. This isn’t to say that you should avoid transcendence or that you don’t deserve to live up to your full potential every moment no matter what…but this is a way of focusing energy on creating that state as a norm, not a random occurrence. Pretty cool , right? Physiological Needs: Are you eating? Well? How is your health? Do you sleep? Exercise? Do you feel well? If you are just getting by physically, you might want to look at this. After all, health is the foundation upon which you build the rest of your life! Safety Needs: Do you have a home? One that you like? Do you have enough money (to live well, not to retire to a desert island that you own!)? A job? Are you holding on to a job that you hate just to hold onto security? If you are living with someone you shouldn’t be living with based on a need for safety, or your work is a misery, that’s considered faltering ground in the security area of the pyramid. Belongingness: Family, Intimacy, Relationships, Friendships… How are you doing? If you have not yet met your soul mate, this isn’t the end of the world, however if you feel lonely, isolated, introverted or socially off-kilter, this is a big area to explore. Esteem Needs: These are both what you think about yourself, and, according to Maslow, what other people think about you. So, that whole idea that being superficial and caring about being dressed up or having nice things… it partially does hold water here. Your appearance is a part of how people view you. However, this is not the primary part of our discussion, since what other people think of you is a slippery slope to focus on. Lets look at how you feel about you, since you can’t control other people’s perceptions and you can get very lost in trying!!! How do you feel about who you are? How do you talk to yourself? Are you never satisfied and never fulfilled? Do you feel you are doing well? The “Higher Needs” (the Cognitive need to understand things, the Aesthetic need for creativity and beauty, the need to Self-Actualize or live up to your potential and, finally, the need to hit Transcendence and help others to become actualized) are the ones we might not meet as often if we get caught up in bad habits and a struggle for survival at the bottom of the pyramid. After all, if you get totally lost in transcendence who will pay your mortgage? Previous post: 7 Lovely Logics! Next post: Training Your Brain To Make Money!